This exercise is a great exercise for the chest which also works out the abdominal area, the glutes as well at balance and proprioception. 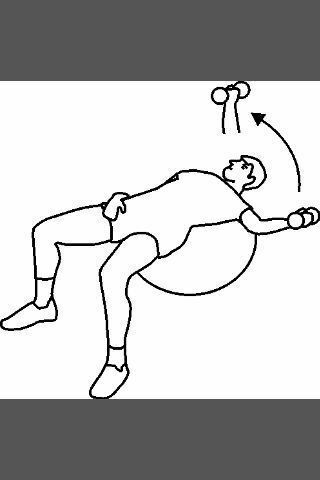 Start: To begin, lie on the physio ball with your upper back on the ball. One hand should have a dumbbell and the other should be on the hip. Keep the hips up in the air. Straighten out the arm and raise it up towards the ceiling. Movement: Brace the abdominal area and slowly lower the arm to the side. Make sure to keep the elbow locked in place and the abs tight. Raise back up to the starting position.